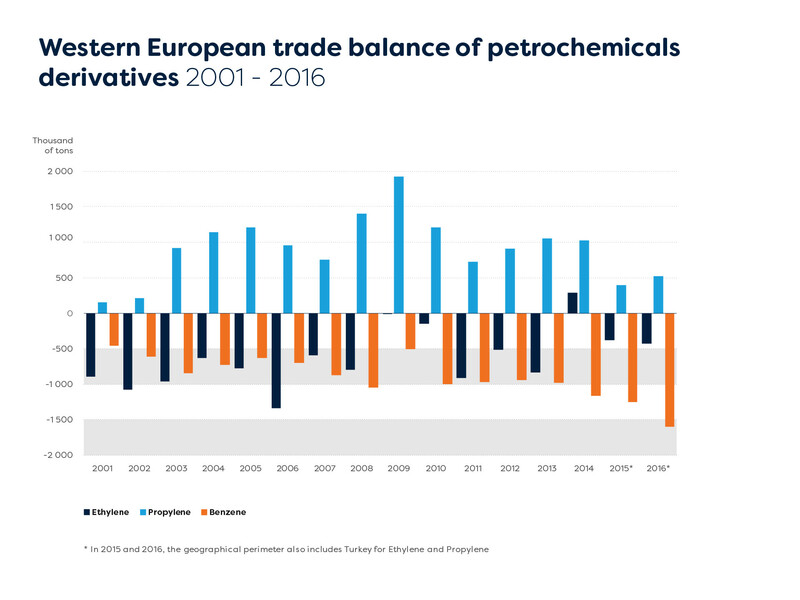 In this section, you will find a review of the market situation for ethylene, propylene and benzene, as well as an analysis of the competitiveness of the European petrochemicals industry. 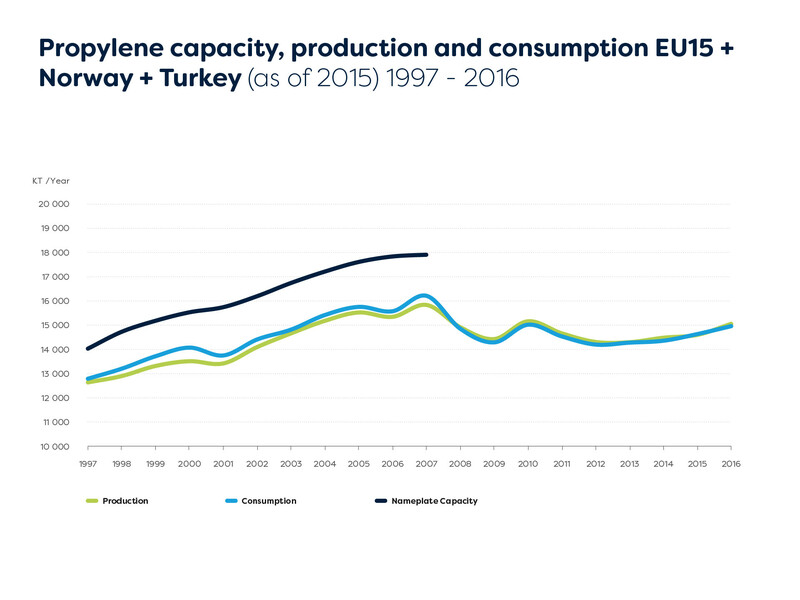 The performances of Turkey in terms of capacity, production and consumption have been included since January 2015 in addition to EU 15 and Norway. 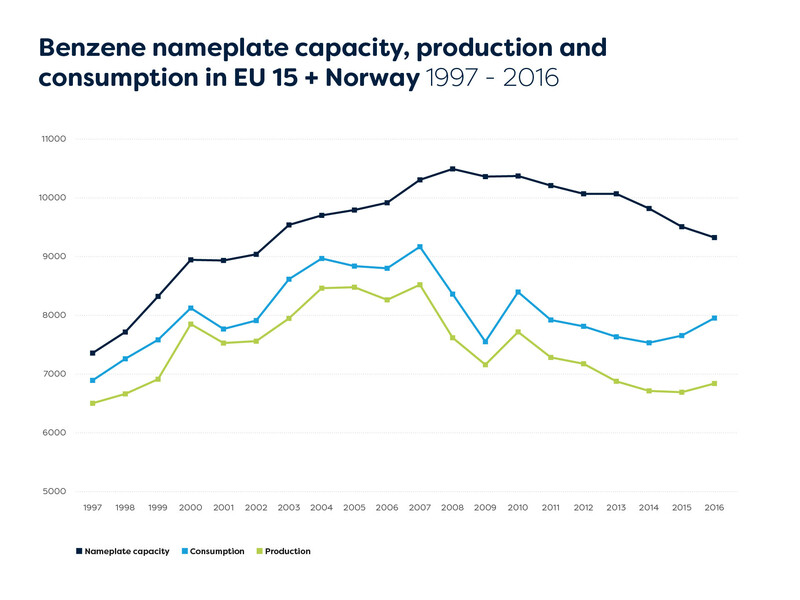 The European crackers operated at 90% of nameplate capacity in 2016. 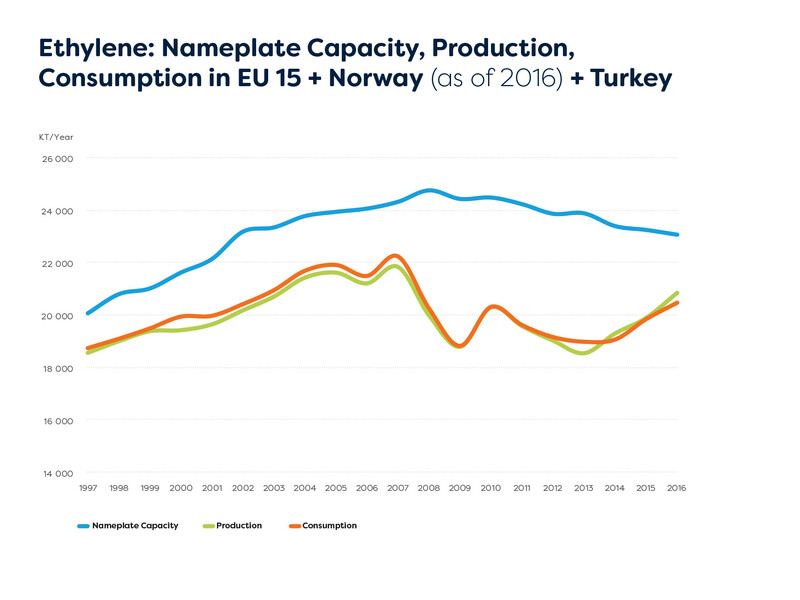 The performances of Turkey in terms of capacity, production and consumption have been included since January 2015 in addition to EU 15 and Norway. 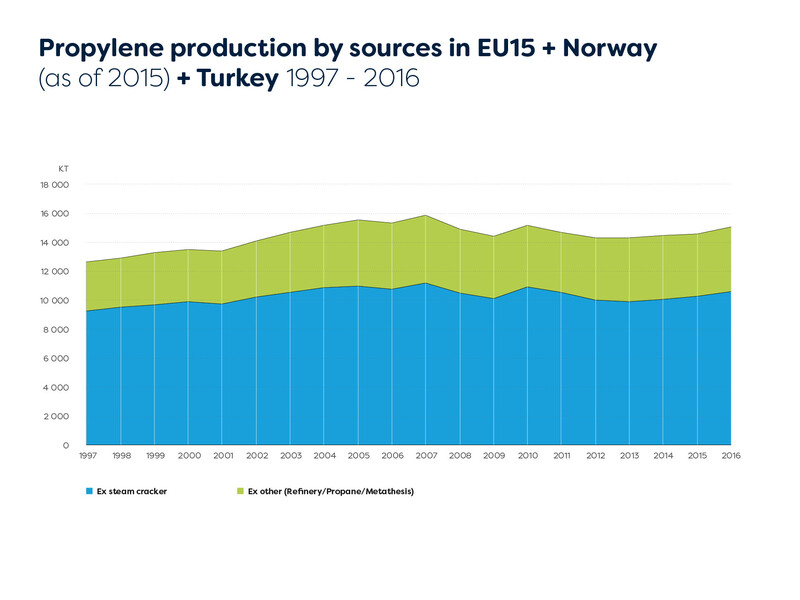 In 2016, the steam crackers propylene/ethylene production ratio was 0.509, at almost at the same level than 2015 (0.518). 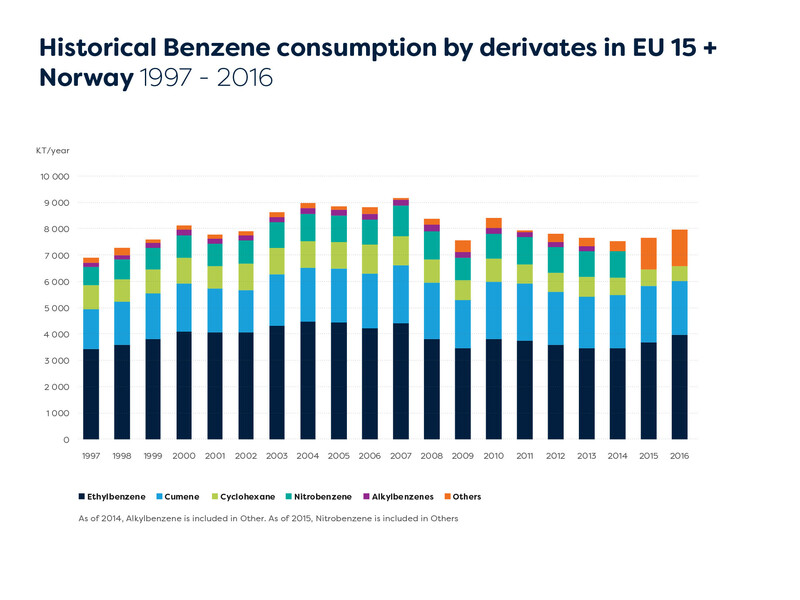 In 2016, Western European benzene consumption (7.955 Kt/y) increased by 300 Kt versus 2015, whilst production increased by 2.2%. 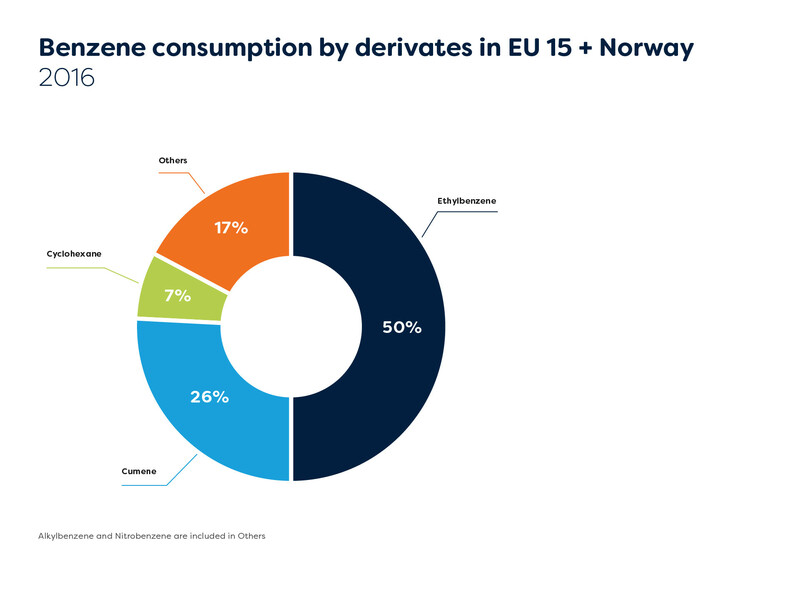 Pyrolisis gasoline remains the first source of supply with 56.2% of the total, reformatted-based production represents 33% and on-purpose and coal-based production represent 10.6%. 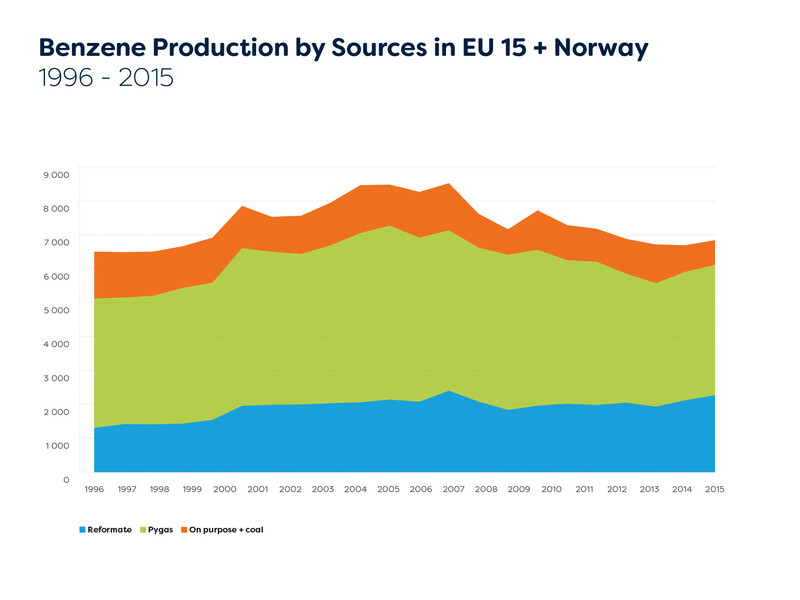 In 2016, the overall production reached 73% of the nameplate capacity. 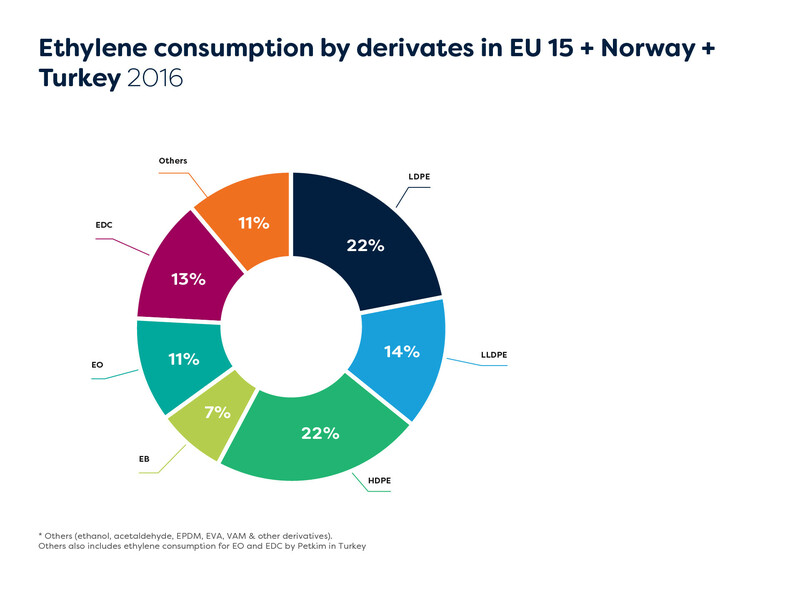 In 2016, imports (1,241 Kt) from outside Europe increased by 9 % compared to 2015, whilst exports to outside Western Europe decreased by 56% with 102 Kt/y. 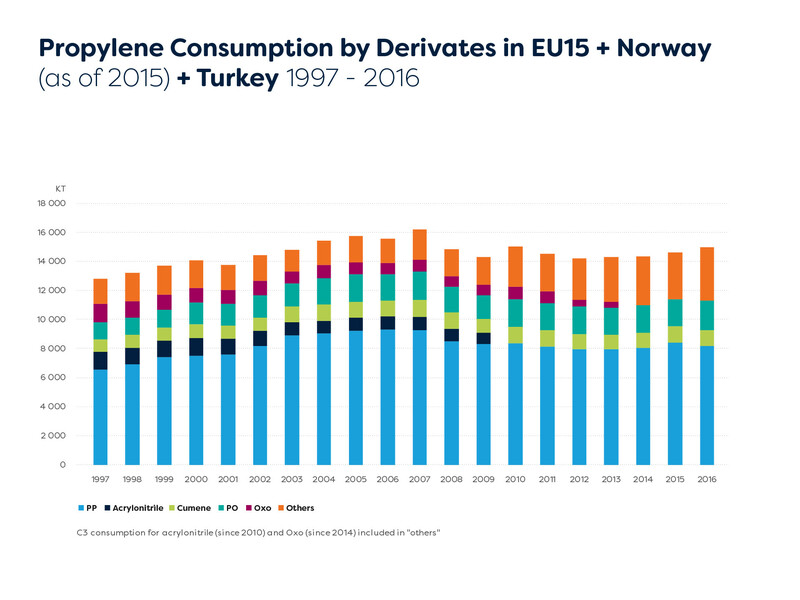 The European trade balances for ethylene, propylene and benzene and derivatives are shown in the following graph. 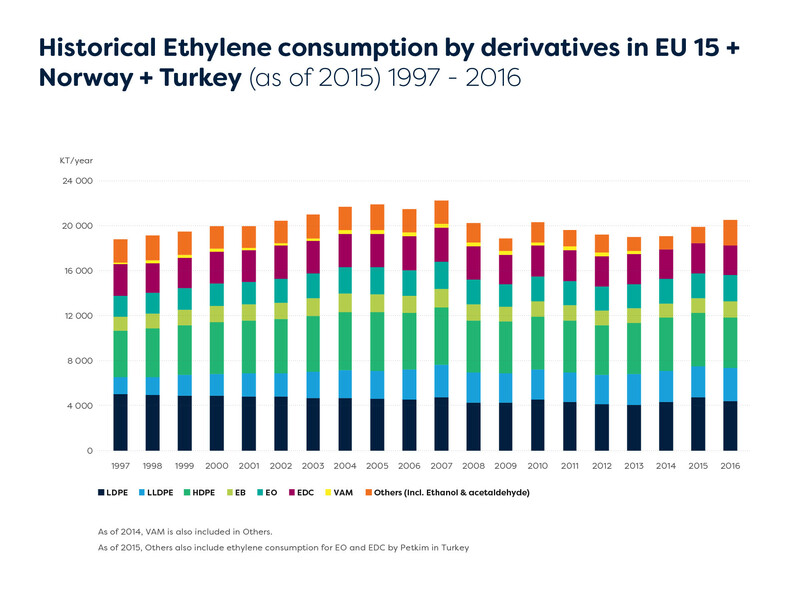 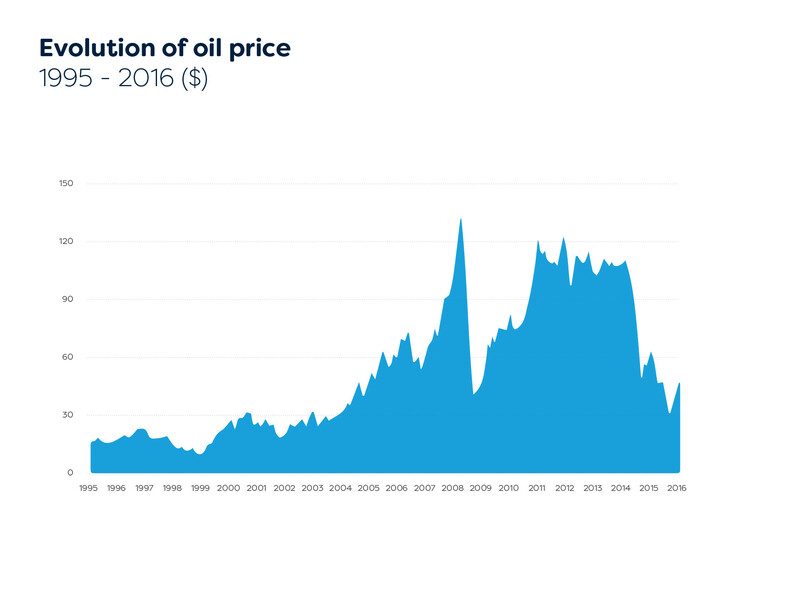 The trade deficit for benzene and derivatives increased by nearly 30% while the deficit for ethylene and derivatives remained stable in 2016, which means that consumption of ethylene and derivatives and benzene and derivatives has been higher than production. 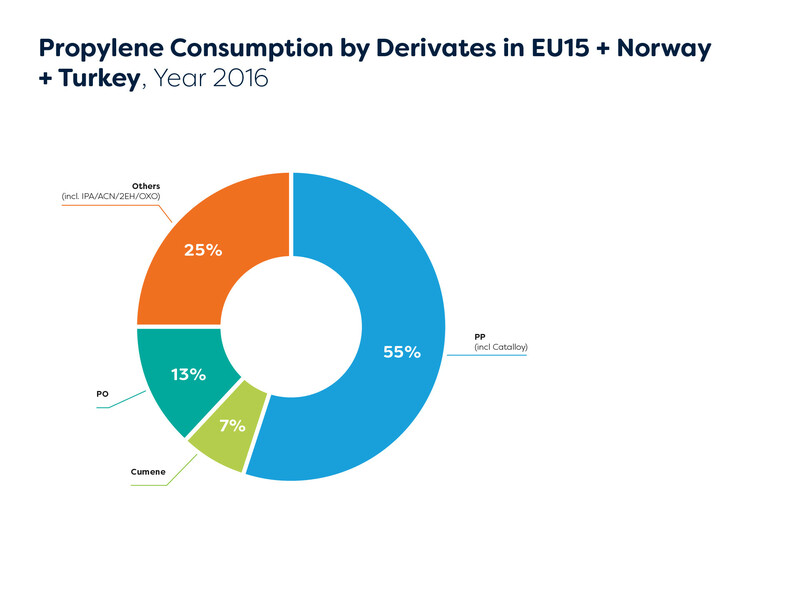 The trade surplus for propylene and derivatives remained stable in 2016.